It was a difficult outing for Real Madrid as they were beaten 3-0 by CSKA Moscow in their Champions League group stage fixture. The Russian side were all over Real Madrid's defence right from the start and got the lead when the youngster, Fyodor Chalov guided the ball past Thibaut Courtois from the edge of the box in the 37th minute of the game. Georgi Shchennikov scored just two minutes before the half-time to increase the Koni's advantage by two goals. The Los Blancos tried hard to make there way back into the game but Arnór Sigurðsson scored his team's third goal in the 73rd minute to put the game beyond the reach of the Spanish giants. Real Madrid enjoyed 69% of the possession during the game but they failed to make the most of it. Madrid also had 19 shots on goal compared to Moscow's 13. The Madrid based team are currently 4th on the Liga table, five points behind the leaders, Barcelona. 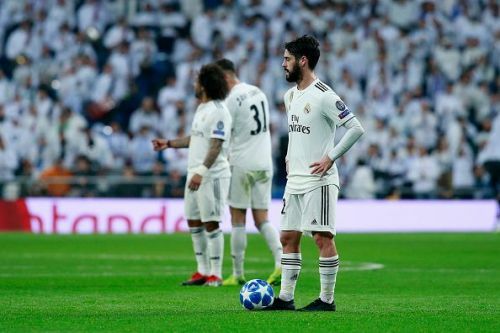 They struggled to fire under their ex-manager, Julen Lopetegui and are now struggling to adjust under Santiago Solari as well. However, with the January transfer window just a few weeks away, the Spanish giants will be looking forward to using it as an opportunity to strengthen their squad. The Los Blancos will host Rayo Vallecano during the weekend before making a trip to Estadio de la Cerámica to play Villarreal. On the other hand, CSKA Moscow are third on the Russian Premier League table and are among the top contenders to win the league this season. They will play against Arsenal Tula during the weekend and then against Ruben Kazan and FC Ural respectively. Football fans reacted to Real Madrid's shocking defeat on twitter and here are some of the best tweets. Barcelona manage to still win games without Messi, Real Madrid manage to get beat 3-0 at the Bernabeu by a team that travelled 4100km’s and you want to tell me Madrid players carried Ronaldo? Nahh we know who carried who! Real Madrid losing 3-0 at home to a team wearing the Blaugrana colors. It's a night of upsets, which means Man Utd now have a chance to beat Valencia tonight. ❌ Worst ever start to a @LaLiga season. ❌ Second biggest El Clasico defeat since 1994. ❌ First home loss in @ChampionsLeague group stages since 2009. ❌ Biggest @ChampionsLeague home defeat ever.